Jack Holt, aged 15, from the Pupil Referral Unit attends Scarborough Construction Skills Village as a pre-16 learner three days a week. Jack started his three day placement in September 2018 after he changed to a part-time timetable at the Pupil Referral Unit. Jack had expressed an interest in pursuing a career within the construction industry and his behaviour within a classroom environment was often challenging; therefore the Pupil Referral Unit believed that a placement within the Construction Skills Village would be beneficial for Jack. 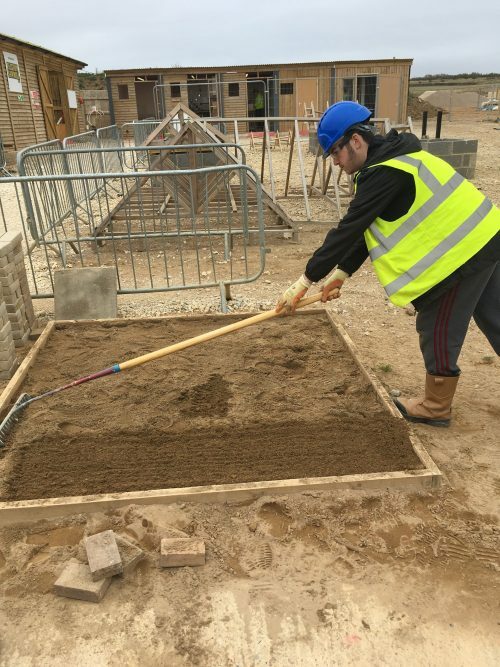 Scarborough Construction Skills Village have offered an alternative curriculum for Jack which includes allocated time working on practical construction based projects. Additionally, Jack is still supported with his learning within core subjects such as Maths and English and provided with time to work on essential tasks such as CV building to help prepare him for future employment. Jack has settled well into this new curriculum and finds that the practical work and smaller groups within classroom-based sessions engages his learning more than a traditional school environment. Jack has tried Brick and is currently working on his paving project within this trade; however, he will also get the opportunity to try Multi-Skills and Joinery. He enjoys hands-on learning and works well both as an individual and in a team. Jack is currently in Year 11 and hopes to continue his placement whilst at the Pupil Referral Unit, and then join the Construction Skills Village full-time once he leaves formal education. Jack hopes to eventually get an apprenticeship within the construction sector and we are confident that he will be successful and ‘work ready’.